After attending a global summit for young ag leaders, Cameron Olson is even more excited about agriculture and its possibilities. Talking to some of the other 100 youth delegates from 49 countries at the four-day Youth Ag-Summit in Belgium last month was an eye-opening and energizing experience, said the 24-year-old from Rocky View. “There were opinions expressed that I’d never thought of before, and ways of looking at things that just aren’t part of our way of doing things in Canada,” said Olson. The Bayer-sponsored conference challenges young people to develop ideas to establish food security in an environmentally sustainable way for a world that gains nearly a quarter of a million people every day. The attendees were divided into groups of 10, with Olson’s group given the topic of how to retain youth in agriculture. It is, he learned, an issue in both developing nations and the First World — and for much the same reasons. However, this problem is especially challenging for poorer regions. Olson’s group — which included young people from Thailand, Germany, Guatemala, Uganda, and Belgium — focused on three areas: How to attract young people to agriculture, how to educate them about the sector, and how to encourage them to enter either primary agriculture, or a support industry. Their solution was both innovative and very practical: Take shipping containers and equip them with everything a small group would need for agricultural output — such as a nursery for plants, a produce-cleaning station, or a place to store herbicides and pesticides. The animal agriculture version was geared towards chickens or goats, such as an egg-cleaning station or a small processing facility. “If you had a small milk parlour or milk-processing parlour as well, you could give them the infrastructure they need to attract kids to agriculture or convince them to stay in agriculture,” said Olson. But the goal is to get up-and-coming young leaders thinking about global issues in a big-picture way. Olson said he learned a lot from chatting with other participants, and one of his takeaways was on the need to listen to consumers. “In order for us to continue to be a sector that is profitable, we have to listen to the concerns of domestic consumers and international consumers,” said Olson, whose family raises Limousin cattle and who was active in both 4-H and the Canadian Junior Limousin Association. While the conference was mostly dominated by crops, Olson did a 60-second interview onstage to tell the attendees about the importance of livestock. “I did everything I could to make sure it was not forgotten that cattle, chickens, and pork are part of the solution as well,” he said. 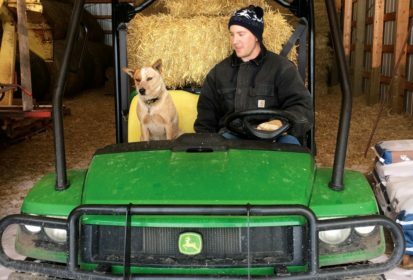 Olson has a bachelor degree and master’s degree in animal science and is currently doing beef cattle research during an internship with Feedlot Health Management Services in Okotoks. In January, he will begin his PhD studies at the University of Alberta.